About a month ago I went to the ER with what I thought was appendicitis. Turned out not to be my appendix but a nasty abdominal infection. Antibiotics cleared up the infection, but while I was in the hospital I got pneumonia. The pneumonia cleared up but not without leaving behind a "loculated empyema" in my right Iung that has to be removed surgically. What can I say - it's been a tough couple of weeks. There were quite a few people who brightened up my life during this dismal period. First is my wonderful client Bernie who flew from Kansas City to NY to surprise me in the hospital. What a guy!!! He brought me some great Andy Warhol-themed gifts including Campbell's Chicken Noodle Soup refrigerator magnets (so clever). Thanks Bernie! Next, my family went out of their way to make me feel better. My parents, my brother and his wife, and my sister called or e-mailed every few days. My nieces got busy and drew me some beautiful get well pictures. And then there is my FANTASTIC husband Mike, who shuttled me back and forth to far too many doctor's appointments, kept my spirits up, and took care of all of the shopping, cooking, cleaning and everything else that had to be done in life. He also arranged for a beautiful bouquet of 50 lilies to show up one day when I was feeling particularly down. I couldn't ask for a better husband!!!!! And I don't want to forget my many wonderful friends who kept in touch and kept me smiling in spite of my illness. You're the best. Thanks everyone. Hopefully after this surgery next month I'll have a full recovery and get back to working on this guy. He's going to be a New England fisherman - but still needs buttons for his rain coat, a beard, pipe, lobster, and assorted details. I'm working on-site right now getting graphics ready for a trial that starts next week. My typical work day runs from about 9:30am to well past midnight. Some days I have so much work that I can't get up to go to the bathroom. Other days (like today) things are very slow and I spend my time poking around in my computer and finding funny old photos I'd forgotten we'd taken. These photos were taken in Ohio a few years ago when we first purchased the underwater camera and wanted to test it out. This is Jesse who wasn't so fond of putting her head under water. Me and Maddie trying to hold our breath. Maddie looking cute under water. Sophie showing us that she is a great swimmer. I also found this cute photo of Mike and the kids taken that same weekend. Our niece Jessie sent Flat Stanley to visit us. Flat Stanley is part of a Social Studies project where school children send Flat Stanley to friends and relatives in other locations so that they can learn about many different places. We had to show Flat Stanley around town and then send him (and his journal and some photos) back to Jessie's elementary school. Instead of heading to the Statue of Liberty or the Empire State Building, we decided to give Stanley a tour of the nitty-gritty street life of our Chinatown neighborhood. We started on the roof to get the lay of the land. We went to look at porcelain Boddhas. We considered letting Stanley get acupuncture. But decided to eat lunch in Little Italy instead. Stanley wanted to ride a scooter. He also wanted to ride the subway. We watched some people play soccer. Then walked past graffitied streets to get back home. What a day! February was a tough month because it was the one-year anniversary of my younger brother Jim's death. Jim was the second of my three brothers to die, so I've now lost two out of three (hang in there Fred!!!). Here's a picture of Jim on one of his many visit to NY to see his big sister. Jim is on the far left in the Chevrolet hat. Notice how happy I looked to have my brother so nearby. Like I said, February is a sad, sad month. and on February 18th (my birthday) this amazingly tasty fruit tart magically appeared in the refrigerator. But overall I'm glad we're done with February and I'm looking forward to a much brighter March. This week Mike and I went back to work in New Jersey and Sophie and the triplets headed back to school in rural Ohio. My sister-in-law Beth sent me this cute picture of Sophie, Maddie, Will and Jessie getting on the school bus on their first day back. Sophie is starting 4th grade. The triplets are starting 1st grade. When I was a kid I went to the same school they now attend. Last year Sophie bought a book at the school library sale and it had my name in the back of it because I had checked it out when I was in 3rd grade! While Mike and I had a break from work I managed to finish up and mail off the commissioned Sophie dolls. I hope Addison and Laura Lee like their new friends! While the world bee population is dwindling, my Dad is having trouble building hives fast enough to accommodate his growing bee population!!! Dad has been keeping bees for more than 40 years. He attributes his success to his bountiful garden and the many fruit trees on his property that provide his bees with good nourishment. When I ask dad about the tremendous success of his garden and fruit trees (so far this year he's sold over 300 pounds of peaches!) 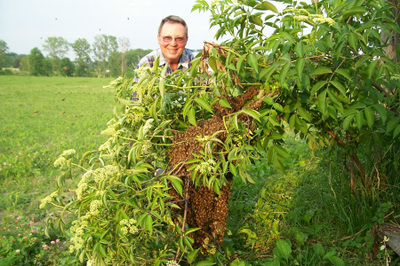 he says the success is due to his bees who provide pollination. There you have it! The secret to hearty fruit trees and a thriving bee population is to have BOTH.